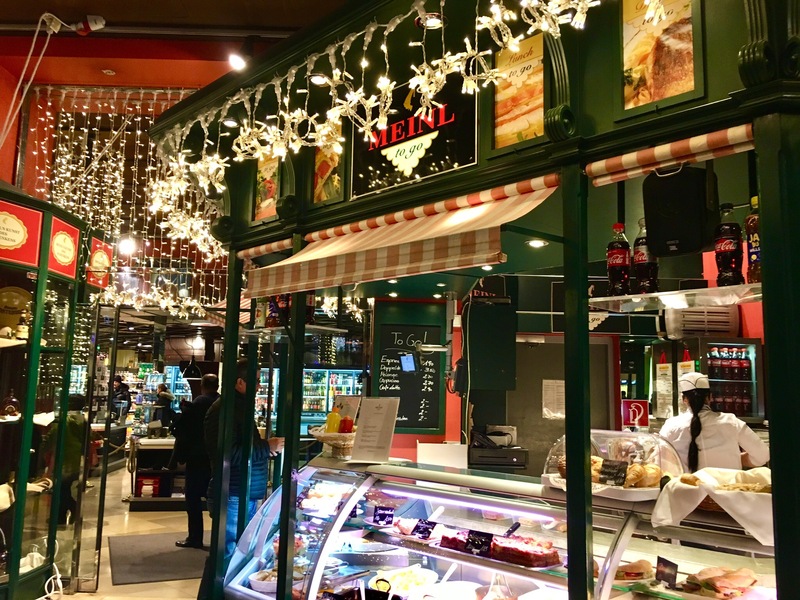 A battle for the hearts and minds – and taste buds – of those who wish to experience Viennese culture occurs on a daily basis. Luckily, we got in the thick of it on our last visit. 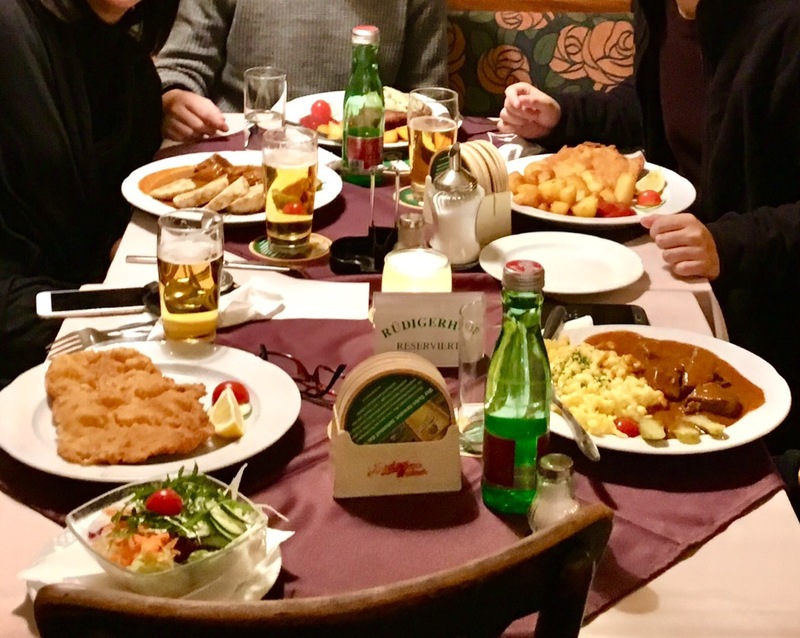 Nothing says Vienna more than its café culture, the opera, and of course, its food – most notably the wiener schnitzel and the torte. Saving the Opera for another time, let’s go straight into the city’s biggest ongoing battle, shall we? That of the city’s famous tortes. I have to admit, I thought a torte is a torte is a torte, right? Well, not quite. My blog partner, Jennie, is in Vienna as of this writing and I’m so glad we’ve both come to the same conclusion. But first, allow me to introduce the two tortes in question. The original one, the Sacher torte, was created in 1832 for Austria’s Prince Wenzel von Metternich by the 16-year-old Franz Sacher, who was an apprentice in the imperial kitchen at the time. The well-kept recipe for this double-layered chocolate cake, with a thin coat of apricot jam in between, is used to this day in Café Sacher. I was a little wary at first as many reviewers complained that this cake was dry. I don’t know if the owners have tweaked the recipe a bit but the batch we had was certainly moist. Our sons even had seconds! What’s worth warning you more about would probably be the ridiculous queue to get a table inside. In fact, we decided to finally do it at the end of our weeklong stay when we chanced upon what looked to be a manageable queue. 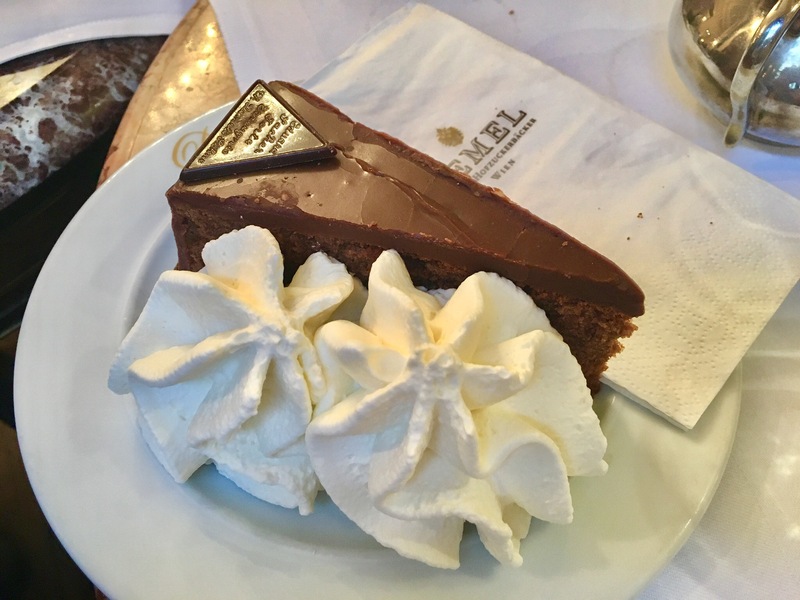 Jennie’s husband, David, highly recommended that we try Café Sacher, and we couldn’t possibly disappoint him, could we? The second torte we tried was the version made by the legendary imperial bakery, Café Demel, near the Hofburg Palace. 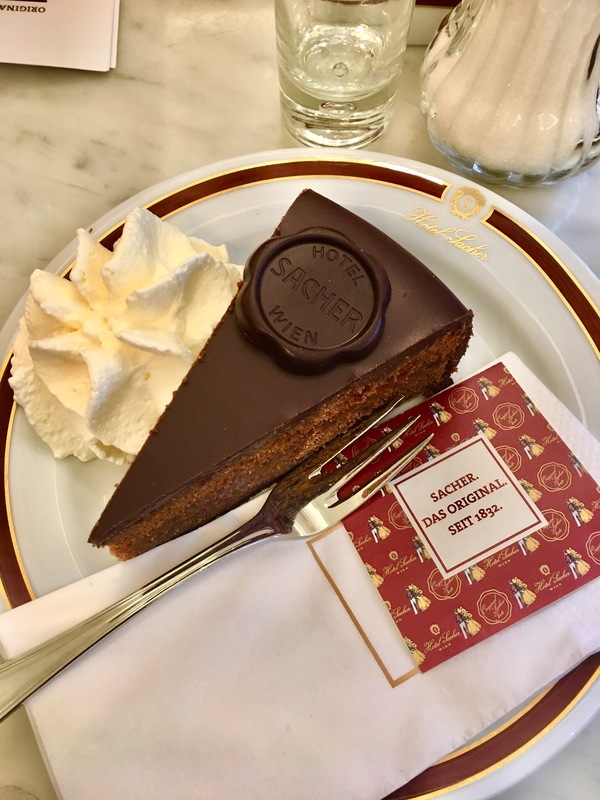 There are many versions of the Sacher torte within Vienna and all of Austria, but what makes Demel’s the prime competitor of the original was the fact that Eduard Sacher, Franz’s eldest son, apprenticed at Café Demel. One story goes that while there, Eduard created his own version of his father’s famous torte – his a single-layer chocolate cake with a thin coat of apricot jam underneath the chocolate glaze. The other story claims that he had left behind a copy of the legendary torte’s recipe. Regardless, the real battle lies in the taste buds of those who eat them. And for me, the winner is…. the original Sacher torte in Café Sacher! A pan-fried thin, breaded meat cutlet, typically made of veal but is now more widely made with pork, the schnitzel is one of Austria’s national dishes. 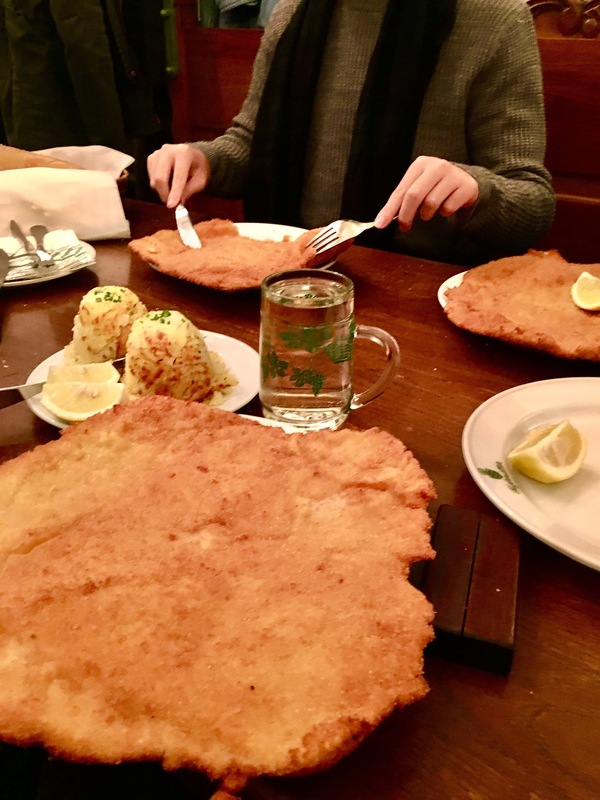 Just going around the city in search of the best Wiener schnitzel should keep you busy during your visit – assuming, of course, your taste buds don’t scream for a break from this quintessential Viennese speciality. The are differences in the way this simple dish is prepared from one restaurant (or home) to the next. What one considers to be the best will surely depend on one’s individual taste. And the two places we chose to try it in couldn’t be as far away from each other along the whole schnitzel spectrum. One, a traditional Vienna institution, the other, a simple neighbourhood place getting rave reviews. Our first schnitzel stop was in Figlmüller, a small restaurant tucked away in a charming alley near St Stephen’s Church. They claim to be the home of the schnitzel. We figured they’ve been around since 1905, so there’s got to be a good reason why, right? So off my hungry brood of five went and proceeded to order one pork schnitzel for each of us. That the portions are generous is certainly an understatement. But it was absolutely delicious, with the breading light and the meat perfectly seasoned. After the size of that Figlmüller schnitzel, however, it took a while for us to get the urge to try another one. But try again we did. This time it was in a slightly out of the way local place called Café Rudigerhof. Set in an Art Deco building, it’s got a charm of its own. The staff were really friendly, too, and when we were there, there was a table of regular customers playing cards. The only downside for me was that since they allow smoking inside the premises, the smell of cigarettes was strong even in the non-smoking area. Neverthless, food there was delicious as well. And their schnitzel? Well, their version was also perfectly seasoned albeit with a slightly thicker breading. And best of all, the size wasn’t as large as Figlmüller’s. Obviously, some of us chickened out on the schnitzel! Rudigerhof’s wiener schnitzel on the left. The verdict? For the second time around, an institution wins for me: Figlmüller! Vienna’s café culture. Who knew? I certainly didn’t until Jennie’s husband suggested my family and I do the rounds of the city’s cafés. 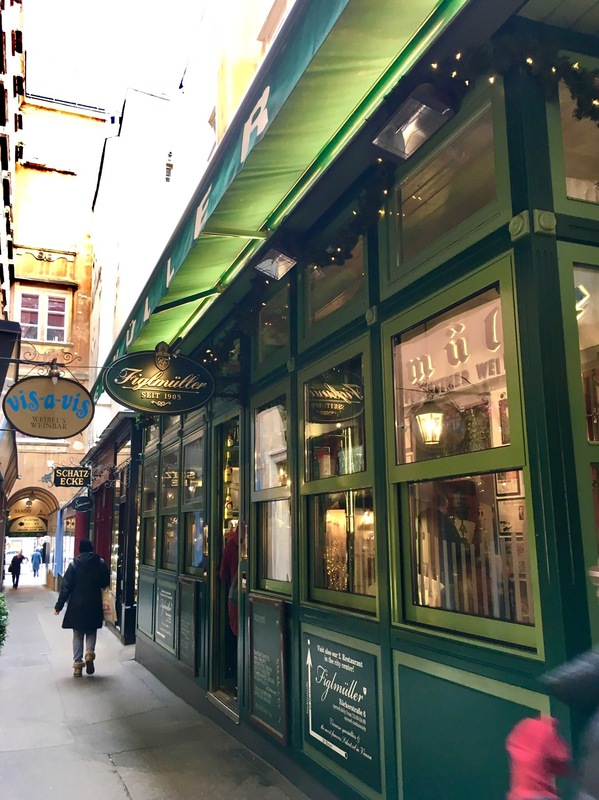 As it turns out, what I thought was exclusive to the French capital, Paris, is actually ingrained more in the life of the Viennese. So much so that in October 2011, Vienna’s coffee house culture was included by UNESCO as among Austria’s national inventory of intangible cultural heritage. 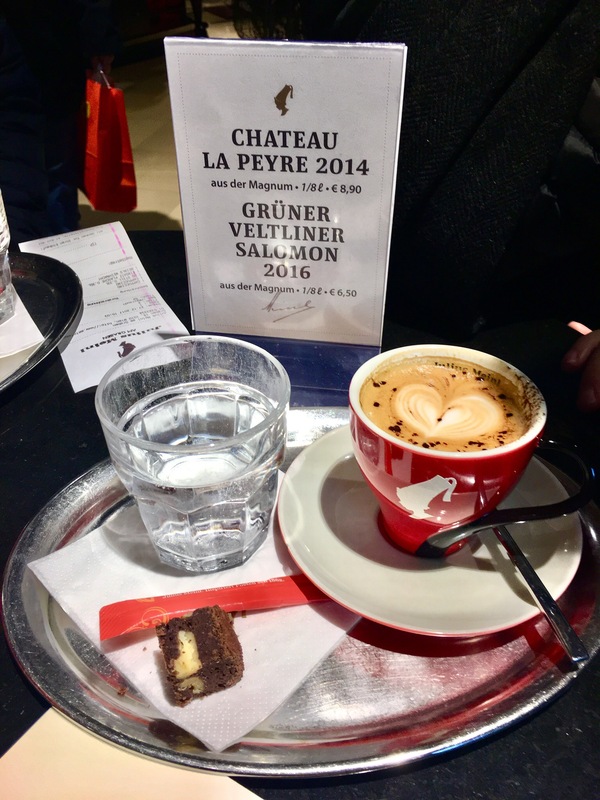 So apart from hanging around Café Sacher and Café Demel (killing two birds with one stone, so to speak, with their coffee and tortes), we trekked to the flagship store of coffee manufacturer and fine foods purveyor Julius Meinl along Graben. It is primarily just that, however: a store. Though it has a wine and coffee bar, it is not a coffee house in the strict sense of the term. (Their prepared food section is great if you prefer some takeaway that’s a bit more special than what you would get at an average grocery). So, enough of Wien yet? Let’s put it this way. With a city amazingly steeped in history and culture, it will take several visits to see and experience everything worthy of your time. And should you decide to go during the Christmas season like we did, the number of activities available to visitors – not to mention the magic – increases dramatically. Admittedly, I did not expect this of Vienna. I thought our plans and the decisions we were going to make along the way were going to be pretty straightforward. Until we got there. Next Next post: VIENNA PASS, IS IT WORTH IT?